Inline figure skating, like ice figure skating, is defined in terms of “edges” — two sides of a wheel (like two sides of a blade) with these “sides" are called edges. 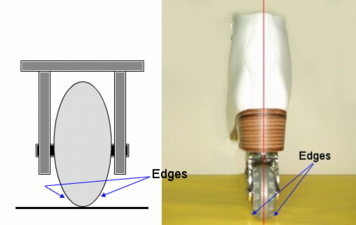 Each skate’s line of wheels has two edges — the “inside edge”, and the “outside edge”. These are shown in the picture and drawing to the right. 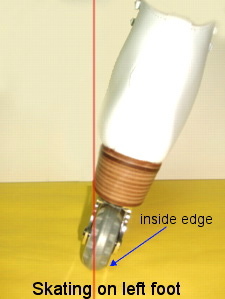 On the skater’s foot, the side of the wheels next to the arch of your foot is the “inside edge” (the inside of the leg); and the other side of the wheels is the “outside edge” (the outside of the leg). 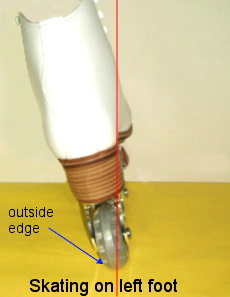 Pictures below demonstrate the positions of the left foot when skating on "inside edge" and "outside edge". Inline figure skating moves are described as a combination of the foot (left or right foot), direction of movement (forward or backward), and use of edge (inside or outside). So there are 8 ways to skate as follows.